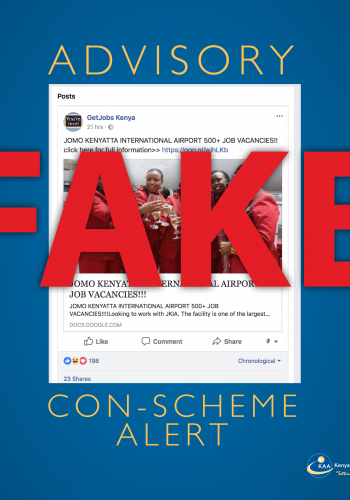 We have noted with concern that some unscrupulous people are using the name of Kenya Airports Authority (KAA) and JKIA to dupe the public about the possibility of getting job opportunities at a fee. The culprits have put up a fake post on Facebook to convince unsuspecting members of the public to send money to them through mobile money. 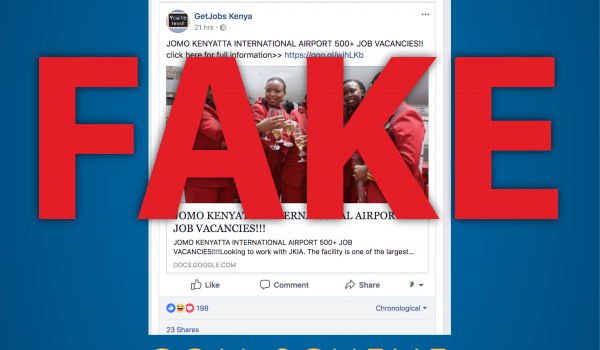 The Public is hereby informed that KAA has clear policies and procedures for recruitment of staff, which start with a formal vacancy advertisement in the media and website (www.kaa.go.ke). Any application for a vacancy should therefore be in response to such an advert. NO PAYMENT REQUIRED. An investigation on this has since been launched, in the meantime, the public is warned to desist from dealing with persons promising jobs at a fee.